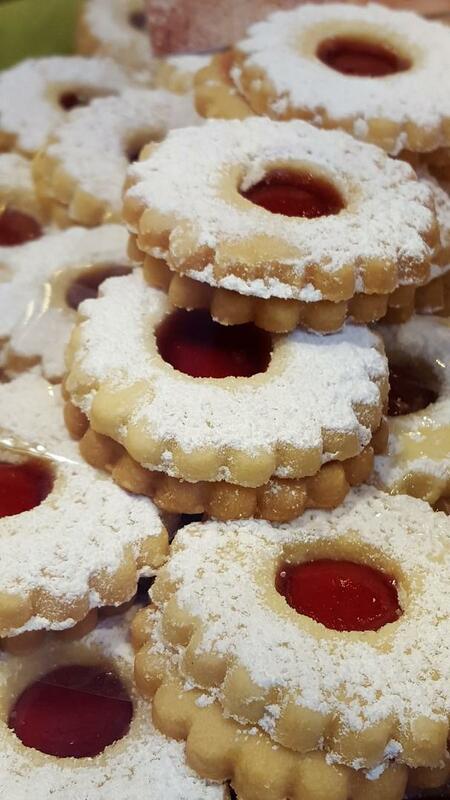 What's more lovely on a holiday cookie platter than beautiful Linzer cookies? These little sandwich cookies are surprisingly easy to make as they’re basically a sugar cookie with a bit of almond flour added. Just cut the dough, bake, spread jam on the larger (base) cookies, dust the smaller cookies )tops) with confectioners’ sugar, then sandwich them together. Easy peasy! This recipe calls for raspberry jam, but strawberry, and other fruit flavors are delish too. This round Linzer cookie cutter set (shown on the right) from Wilton is adorable and it's only $5.99 for 6 cutters!. They also have a square set for $18.22. This set from Cake Boss is also a lovely one at $14.99. You’ll need two baking sheets lined with Silpat mats or parchment paper. To make the dough: In a large bowl, beat the butter, sugar, zest and cinnamon until fluffy, about 3 minutes, then beat in the egg yolk and vanilla until combined. In a separate bowl, whisk together the flour, almond flour, and salt. Add the flour mixture to the egg mixture and mix until just combined. Be careful to not overwork the dough. Divide the dough in half, and form each half into a disc. Wrap in plastic wrap, and refrigerate until firm, about 1 hour. To assemble: On a lightly floured surface, roll one disc of dough out to about 1/4"-thick. Using a 2 1/2" round cookie cutter, cut out cookies. Transfer rounds to a Silpat mat or parchment-lined baking sheet. Gather the scrap dough, roll, and repeat. Place the cut cookies in the refrigerator for 30 minutes. While the first half of cookies is chilling, cut rounds from the remaining dough. Once cookies are transferred to a baking sheet, use your smallest cookie cutter or the end of a round piping tip to make a window cutout in the center of each. Place cookies in the refrigerator for 30 minutes to chill. To bake: Bake all of the cookies for 8 to 10 minutes, or until the edges are just beginning to turn brown. Let them cool for 5 minutes on the baking sheets, then transfer to a rack to cool completely. To fill the cookies: Place the cookies with the holes in them on a cookie sheet and sift confectioners' sugar over the top. Turn the remaining cookies flat side up and spoon 1/2 teaspoon of jam into the center, spreading it slightly. Top with the sugar-dusted cookies.